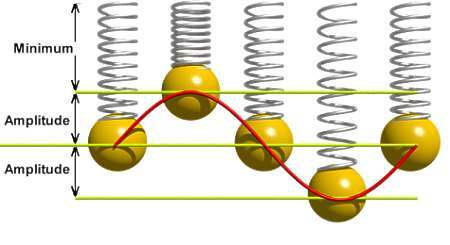 About oscillations of spirals in sine rythm. For the construction of a spiral pendulum we need to calculate its actual length. The spiral oscillates around their medium length by a sine oscillation. #declare Time_test = 0.25; // 0.25/0.75 shows maximum/minimal extension!!! For testing I added here the value "Time_test" to the time value "clock". This allows to check if the minimal and maximal extension of the spiral is inside of the render window! you can find here: 3D-Animations - Oscillations .